The Internet of Everything (IoE) is expected to enable global private-sector businesses to generate at least $613 billion in global profits in 2013, according to a study released by Cisco. The report found firms that optimize the connections among people, process, data and things will generate the largest profits. Corporations could nearly double those profits through greater adoption of business practices, customer approaches and technologies that leverage IoE. While IoE is already driving private-sector corporate profits, it is estimated that an additional $544 billion could be realized if companies adjusted their strategies to better leverage it. According the Cisco IoE Value Index report, based on 7,500 global business and IT leaders in 12 countries, United States, China and Germany are expected to realize the greatest value in 2013. Rob Lloyd (President, Development and Sales, Cisco): The Internet of Everything has the potential to significantly reshape our economy and transform key industries. The question is who will come out on top and win in this new economy. 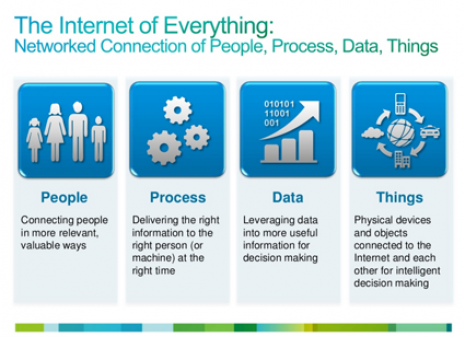 The Internet of Everything is the networked connection of people, process, data and things, and the increased value that occurs as ‘everything’ joins the network. Several technology transitions — including the Internet of Things, increased mobility, the emergence of cloud computing, and the growing importance of big data, among others — are combining to enable IoE. The Internet of Everything Value Index builds on research that Cisco conducted earlier this year, which found that global businesses could pursue as much as $14.4 trillion over the next decade by leveraging IoE to improve operations and customer service. 69 percent said they thought the global job market would stay the same or improve due to IoE. 89 percent thought wages would improve or stay the same. In addition, business leaders believe that the Internet of Everything will help drive better information security — an indication that they understand the importance of security and privacy to the growth of IoE. Fifty percent of business leaders said IoE would improve security while 26 percent thought there would be no change. 2] While businesses in the United States, China and Germany are poised to realize the greatest level of profits in 2013, IoE value is spread across firms around the globe. 5] While the Internet of Everything is driving a huge amount of corporate profits, an additional $544 billion could also be generated in 2013 if companies adjusted their strategies to better capitalize on it. Invest in high-quality technology infrastructure and tools. Adopt and follow inclusive practices that enable all employees to contribute. Manufacturing firms: real-time, multidimensional data analysis; integrated video collaboration; remote tracking of physical assets. Energy firms: integration of sensor data; ability to locate experts; predictive analytics. Retailers: predictive analytics and data visualization; BYOD and interacting with customers using rich media; mobile payments and remote customer monitoring. 8] Among industries, services ($158.8 billion) and manufacturing ($103.1 billion) are expected to realize the greatest IoE value in 2013. 10] An analysis of IoE-generated profits underscores that company size is not necessarily an indicator of which firms will benefit most from it. In fact, the study drives home that market incumbency is at risk as IoE grows in impact. We are at the early stages of the development of the Internet of Everything, but firms have huge incentives to adapt now to take advantage of it, says Cisco. Over the next decade, $14.4 trillion in profits could be achieved by companies that leverage IoE either to create new value or to gain value from competitors that don’t adapt as quickly or effectively to take advantage of new innovations. You can find a copy of the Cisco IoE Value Index study here.